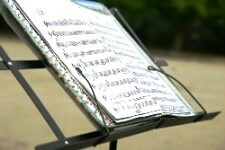 Musicians who sight-read fluently enjoy huge artistic and professional advantages. On the artistic side, they’re more versatile than weak readers because they can quickly assimilate diverse styles of music. Professionally, they can perform with minimal rehearsal, so they’re the first to be contacted when opportunities arise. In spite of those benefits, many music students neglect to practice sight-reading. Why? It seems that, aside from laziness, some aren't sure how to develop their reading skills and, as a result, become discouraged by their lack of improvement. I’m convinced that fluency with sight-reading can be attained by any musician with adequate visual acuity, but it takes smart, persistent work to build up reading skills. Here are essential things to emphasize in your sight-reading practice. Bear in mind that the term “sight-reading” refers to the artful performance of an unfamiliar score with no more than a minute or two to scan. Only accessible music enables us to acquire habits of fluency. All too often, though, students unwisely choose to sight-read overly complex material. If your reading skills need upgrading, opt for elementary music, and then step up the difficulty over an extended period. Ideally, consult a teacher who can evaluate your skills and recommend suitable material. Also strive to assemble vast amounts of sight-readable music so that you never lack for scores. Sight-reading skills require ongoing reinforcement if they’re to become second nature. I advise ambitious students to practice reading a minimum of 15 minutes daily (during my youth, I practiced reading 30 minutes a day for years). Even when your practice time is limited, try to carve out 5 minutes. In addition to reading on your own, try to gather weekly with one or more colleagues to read ensemble music – doing so will bolster your skills and motivation. Scan first. I employ a standard scanning procedure, which I detail on page 101 of The Musician’s Way. In brief, when scanning, we promptly identify a composition’s structural and expressive elements – especially rhythmic, melodic, and harmonic ones – and make note of any repeats or navigation signs. Count mentally. When reading, our primary task is to maintain the rhythmic flow. Therefore, use a metronome in practice, internalize the pulse, and mentally count in line with the musical context. Look ahead. Be sure that you digest at least one note group ahead of the one you’re playing or singing. Also, adjust the span of your eye fixations according to the musical context – the simpler the music or faster the tempo, the larger the span of notes you see at once. More info about eye movements during sight-reading can be found in this well-referenced article on Wikipedia. Keep going. When you flub, rather than interrupting the motion, keep the pulse intact and your eyes ahead. If a florid passage exceeds your ability, either omit it or just execute the notes on the main beats. Express the music. Expert sight-readers are artistic readers. So faithfully express the character of everything you read – give expression markings equal importance as pitches and rhythms. Minimize effort. Insist on ease whenever you read. Even when the going gets tough, release tension and be positive. When we steadfastly emphasize ease in our practice, easefulness becomes our default habit. See pages 99-102 of The Musician’s Way for inclusive ways to practice and improve sight-reading skills. A version of this article first appeared on The Musician's Way Blog, where you'll find related posts under the Music Practice category. June 12, 2012 at 07:41 PM · Good Stuff, as usual! June 12, 2012 at 09:46 PM · Thanks, Simon. I'm gratified by your kind words and support. June 13, 2012 at 03:43 AM · A wonderful overview! Over years of teaching both in the US and in Europe, I came to consider rhythm as the ingredient that can make or break sight-reading. A thorough understanding of the note values, the ability to group them into larger units (such as beats) in an instant, not being thrown off by rests, all will bring a steady pulse and a feeling for the meter. Once this rhythmic/metric sense is achieved, the eyes will automatically look forward in search of the material to fill the next rhythmic unit. Unfortunately, rhythmic training - especially in the bowed string instruments world - seems to me way behind. How many first year college students will stumble over the rhythms in Bach's G minor Adagio from his first solo violin sonata? Look at the materials for private/class instruction published and used by studio and orchestra teachers in the US. There is barely anything to motivate the beginner students to count, to challenge them. As we take care to help them develop good habits: good bow arm, good intonation, sound production, we should make rhythm also a priority, one good habit that will definitely help them sight-read like pros. June 13, 2012 at 09:50 AM · I saw a Russian violinist ,I think he was an orchestra leader , advising in sight reading , to avoid the ends of the bow as that might stick you into an awkward situation. He wanted to keep his options open . You can play quicker in the middle and string changes are easier away from the tip . June 13, 2012 at 06:47 PM · Thanks for contributing, Adrian and John. My experiences regarding rhythmic training match up with Adrian's. I've found some classic vocal methods to be helpful - e.g., Rhythmical Articulation by Pasquale Bona - as well as some standard sight-singing and solfege collections. Students who might not be ready to actually play all the pitches in these sorts of methods can still gain tremendously from vocalizing or clapping the rhythms. I am not a sales person for this program. I had used it with my students for years and I have seen the benefits. Of course, results can be achieved by using any well-thought-out method logically and consistently.